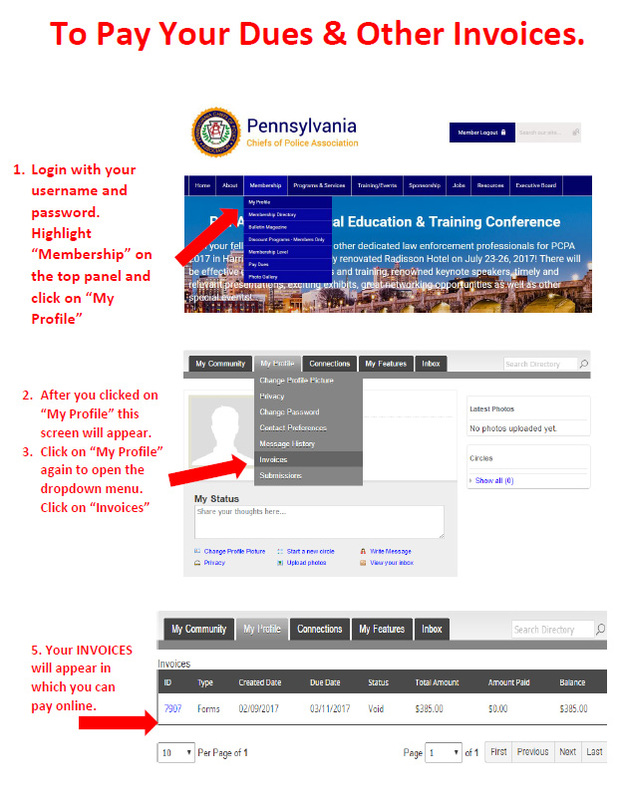 The Pennsylvania Chiefs of Police Association has several tiers of membership for you to stay involved and connected with your peers. Please view Article IV, Membership, of the Association’s By-Laws for specific membership eligibility requirements. Go to PCPA By-Laws, Article IV - Membership. Associate Member $25.00 * no initiation fee is required. NOTE: Membership is non-transferable. When your agency replaces the member, the person in the new position must apply for Membership and be approved by the Executive Board. All Command Level Officers (chiefs of police, superintendents, or commissioners and those holding the rank of Lieutenant or above) who are full-time officers of municipal police agencies in the Commonwealth of Pennsylvania or the Pennsylvania State Police; Command level agents or directors of any law enforcement entity of the United States government (FBI, etc.) if, at the time of application, such persons are headquartered in the Commonwealth of Pennsylvania; and; full-time persons with command-level responsibility in any law enforcement agency of the Commonwealth of Pennsylvania (Office of Attorney General, etc.) Membership includes access to the Members Only Sections of this website and other such privileges. Chiefs of Police who work part time, Police Officers In Charge of Police Departments, Directors of Police Agencies, and Ranking officers who have a supervisory role in a police department. This category also includes agency heads of Corporate Security and Police Academies. Membership includes access to the Members Only Sections of this website and other such privileges. Open to those persons, who by occupation or personal inclination, share a mutuality of interests with the Association and its membership and wish to support the activities, programs and services of the Association. Membership includes PCPA product. Once you have been an active member for 20 years and have retired, you are no longer required to pay dues. Logging in to the website: Your username is your full email address. If you do not remember your password, this can be reset at the login screen. Membership dues cannot be paid over the phone. Dues can be paid online or with check. All invoices can be paid online. If you need assistance with accessing your online invoice, click here. Don't forget to update your membership profile if you retire or switch agencies. *all fields must be completed, including REGION. [IE: Northeast, Southeast, Central or West], County, & Recommending Member. All questions must be answered correctly on the application or your membership application will not be submitted for review.